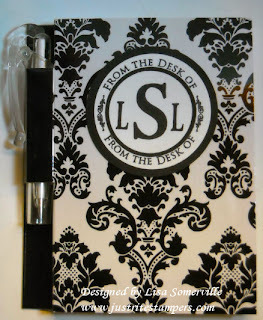 While looking for some alterable items at Michael's today, I came across some memo pad holders in the $1.00 section that would be great to alter....The black and white one came that way, all I did was add my JustRite Monogram - using the Borders and Centers and my alpha. I used the 1-1/4", 1-3/8", 1-3/4" SU Circle Punches and my Coluzzle for the circles. Pretty easy! Next I decided to take apart one of the holders and create a template, so I could mass produce them for craft shows. I just need to get to the office supply store and pick up small pens and scratch pads. To create the cover shown here I stamped my Ornate Tooled Leather from Starving Artistamps, let it dry, then followed the directions for Opalite Color Infusions Technique and added the Bandanna Technique both from the TJNL - very shimmery IRL. 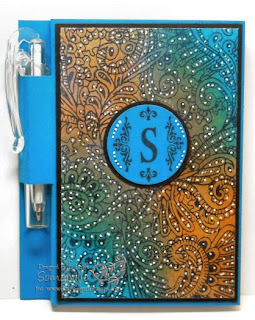 I used the C-30 Monogram Stamper and SU's 1-1/4" and 1-3/8" circle punches. These are super easy to make. Click on the photo below for a close up of the directions. 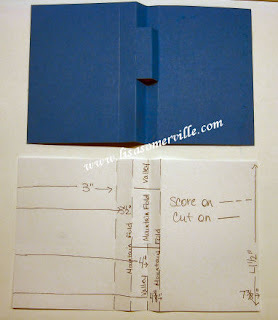 Start with a 7-3/8" x 4-1/2" piece of card stock. Score as shown below - 3", 3-1/2", 4", and 4-3/8". Score, cut and fold as show.